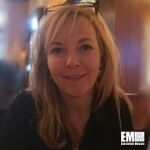 Katie Ebrahimi, a former executive at DXC Technology (NYSE: DXC) and Hewlett Packard Enterprise (NYSE: HPE), has been named a senior vice president and chief human resources officer of Unisys (NYSE: UIS) in a move slated to take effect April 26. Unisys said Monday Ebrahimi will report directly to President and CEO Peter Altabef and succeed Dave Loeser, who will step down as SVP and CHRO after serving five years in these roles. Ebrahimi and Loeser will work together through the end of March to facilitate a smooth transition, the company added. She previously served as HR VP for DXC’s global delivery organization and held a similar position within the HPE’s enterprise services, global practices and solutioning business. Before HPE, she worked in various HR leadership roles at Cisco Systems (Nasdaq: CSCO), Sun Microsystems and McAfee.